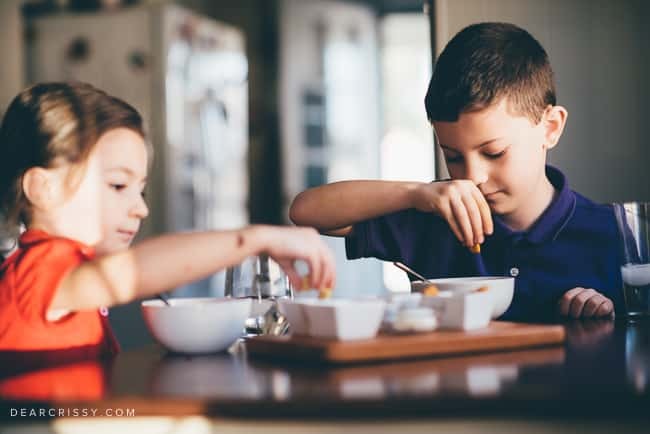 Home » Lifestyle » Parenting » How Do You Soup? I’m excited to be a partner with Campbell’s Soup as a blog ambassador. Opinions are genuine and all mine. Did you know that January is National Soup Month? With winter’s grey skies and a constant chill in the air, it makes sense. Trust me when I say that I am completely on board with any excuse to eat more warm, comforting soup. Soup is also a winner in our family because of its versatility. We’re going through a really tough phase with the kids, ages six and four, when it comes to mealtimes. I can usually please one child at the table but never both. I’ve heard more than a few of my parent-friends declare that they won’t be short order cooks for their children, but I have a confession to make. For me, being a short order cook and flexing to meet my kids’ meal preferences is sometimes necessary to spare myself the grief and turmoil that can arise during mealtimes. There have even been a few rough nights when I cooked three different meals. I try to block those nights out of my mind! I’m not always so quick to bend to a four-year-old’s will, but on those days when I’ve worked ten hours and I just need five minutes of peace, it’s happened. One trick I’ve found that helps make everyone happy is creating a buffet of food choices. It seems that as long as the kids have several items to pick from, they are far more likely to eat. For instance, both kids like tomato soup… usually. Only a parent will understand what I mean by that. 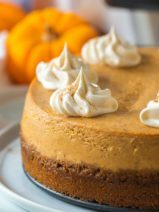 It’s a proven fact that they may enjoy a food, because you’ve seen them literally scarf it down in the past, but depending on their mood, the phase of the moon, the weather or whatever strange unseen force rules toddlers and preschoolers, they may or may not eat the food on THAT PARTICULAR DAY. That scene from the film Napoleon Dynamite pops into my head where he’s trying to feed the llama. Sometimes I just want the kids to eat the food. My brilliant solution? 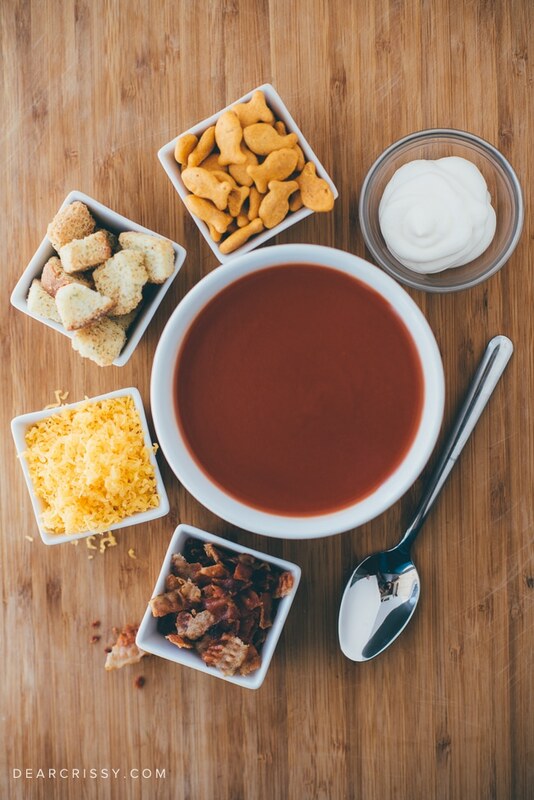 A carousel of toppings for their Campbell’s Condensed Tomato Soup. 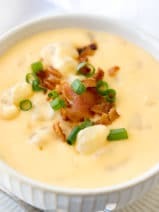 I fill small dishes with a few of their favorite soup toppings like crackers, croutons, cheese, sour cream and crispy, crumbled bacon (I just microwave a few slices of the pre-cooked stuff). 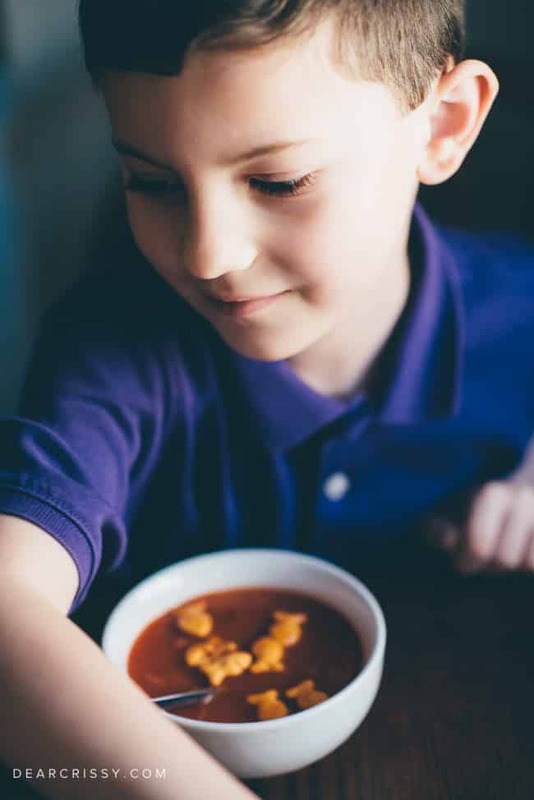 Being presented with a range of topping choices for their soup makes lunch really fun, and they are always eager to get creative and make it just right. Hey… whatever it takes to get them to eat the food! On the flip side, my adoration of soup is pretty unwavering. Soup is the epitome of comfort food in my book, and in my hectic life I always welcome a warm bowl of comfort. Right now I’m loving Campbell’s Fresh Brewed Soups. 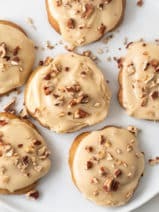 At 70 calories or less they are the perfect hot snack to fuel me through my busy days. I’m already a Keurig-junkie so making this soup was like second nature for me. It’s hot, flavorful and best of all—easy. Easy fits my lifestyle just perfectly. Don’t miss your opportunity to get in on the National Soup Month fun! I’m giving you permission (as if you needed it) to enjoy a warm bowl of your favorite soup for lunch to day. You know, to celebrate. I’d love to hear how you soup. What is your favorite type of soup? Do you use any special toppings? I grew up on Campbell’s Soups. The Chicken and Stars always came out when I was sick! I too have told my kids that I am not a restaurant but I have to agree that sometimes it’s just easier to cook everyone what they like, even if that means we’re all eating 4 different things. Customizing soup is definitely a great way to let everyone have their meal their own way. I didn’t know that January is a National Soup Month. I like the idea of creating a soup buffet. My girls love soup, too. I make tomato soup all the time for my kids. I never thought about mixing in stuff until my mother in law did it at dinner one night. Yum. Bacon and cheese all the way! Love tomato soup! We love to have soup for lunch a few times a week. I will have to try the Gold Fish on top for the kids this week. These are great ways to enjoy your soup. I love to mix a can of Tomato and a can of Vegetable soup with one can of water. It is so delicious with a bit of cheese on top. Campbell’s tomato soup is my favorite! I love to dip grilled cheese sandwiches in mine. I also love putting saltine crackers in the soup. It’s really good. We’ve never eaten so much soup as we have this season! We love Campbell’s Tomato with Goldfish! I love to have something crunchy in my soup! Crackers or tortilla strips, soup is the best in the winter! 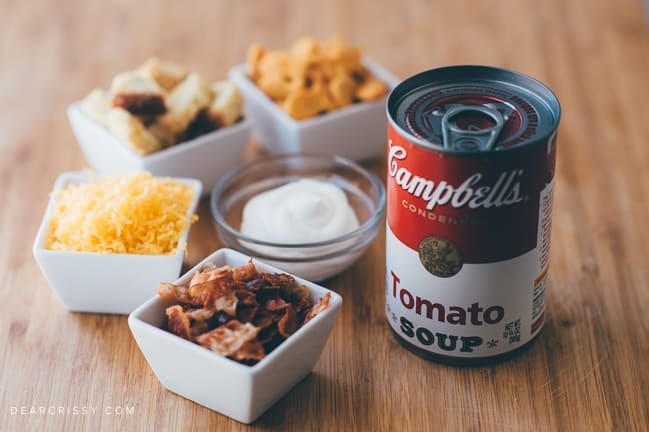 I’ve always loved turning to Campbell’s tomato soup in a pinch- it’s my rainy day go to and I love tossing all sorts of mix-ins in. I would definitely serve it to my kid! As for those K-Cups, I am already waiting for them to hit my area- how exciting! I love putting milk and basil in my tomato soup! I love tomato soup! I think next time I will also add croutons. My husband is a big fan of soup. He usually likes it with Oyster crackers in there. Wait! 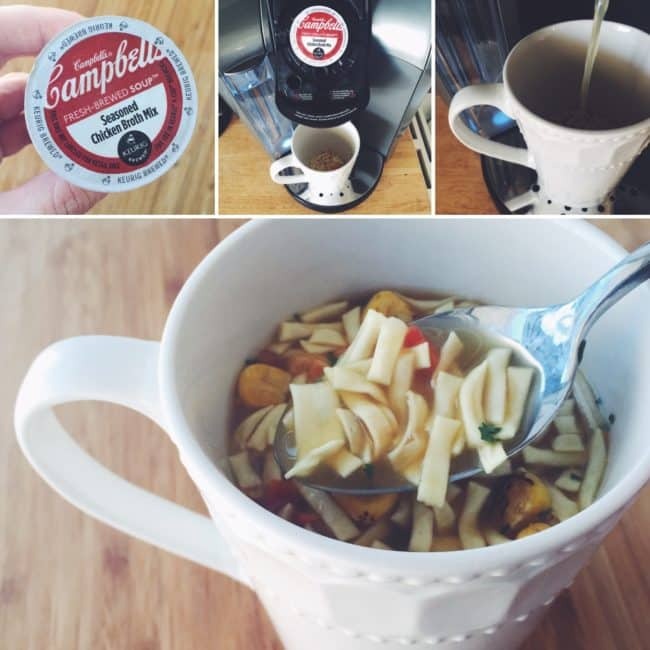 Campbell’s Soups can be made in your Keurig?! How did I not know this! I love chicken noodle soup with soda crackers. Easy peasy! Soup is one of my favorite meals to make for the family. They’re a great base for all sorts of creative add ins. One of my favorites is tomato soup with a dollop of sour cream on top.